Background: Problems of emotional regulation and lack of social skills in veterans' families are very common and like psychological complications have unpleasant consequences for them. Therefore, effective and helpful interventions and therapies are highly important. Objectives: The current study aimed at evaluating the effect of mindfulness-based stress reduction (MBSR) on the improvement of emotional regulation and psychological well-being in veterans' homemakers with secondary posttraumatic stress disorder. Patients and Methods: In the current study, the permuted blocked randomization method was used. Participants were selected from veterans' homemakers referred to the counseling center of veterans in Kashan city (Iran) in 2015. They were randomly assigned into two groups (30 controls and 31 cases). The case group underwent the MBSR treatment. Results: Results showed no significant difference between the two groups at the baseline (P < 0.05). No significant difference was observed in the total score of MBSR on emotional regulation between the groups. However, the difference between pre- and post-test of rejection of emotional response subscale was significant. In addition, the total score in the psychological well-being at pre- and post-test was significant. Conclusions: It seems that MBSR significantly affects the psychological well-being, but it has no effect on the emotional regulation except the subscale of emotional response rejection. The harmful effects of war are the incidence of mental and physical problems, which emerge in those who were directly or indirectly involved in the war. The mental injuries grip the victims for a long time. One of the problems may be the development of posttraumatic stress disorder (PTSD). The complication occur with symptoms such as extreme fear and insecurity, fear of repeating the disaster (flashbacks), irregular heartbeat, nightmares, anger, helplessness, avoidance, depression, anxiety, feel guilty, and hypervigilance. Long-term effects of war on the mental and social state of such veterans suggest that elapse of time is not in favor of them, but it increases symptoms associated disorders along with age increase. Furthermore, studies showed that 72.2% of Iranian mental veterans have symptoms of PTSD; the persistence of such symptoms is associated with the exacerbated family relationships, less life satisfaction and happiness, and higher needs for mental health services. Clinical experiences and repeated observations by the researchers suggest that veterans' families deal with the higher levels of mental problems. A study showed that 21.6% of PTSD veterans' homemakers showed some of the symptoms of secondary trauma stress, however, 41.6% showed severe symptoms. Another study showed that 39% of veterans' homemakers developed secondary trauma. Through empathy exists between the victim and family members, they also have psychological distress, which is called the secondary stress response to trauma. Secondary traumatic stress means a psychological reaction to the traumatic experience of another. In this regard, psychological well-being as well as emotion regulation are among the problems that veterans and their families tackle with, which is associated with stress. There are different approaches to treat secondary PTSD, which demonstrate their effectiveness in certain cases. However, each approach has weaknesses that should be further investigated in studies and clinical trials, and it resulted in the growth and formation of newer approaches. Approaches approved in experiments include drug therapy, cognitive-behavioral therapy, biofeedback therapy, and schema therapy. However, what matters is that in many cases these treatments act in an avoidance manner and do not pay attention to the emotions. Most of the previous therapy limitations were the lack of lasting therapeutic effects and possession of relapse phenomenon. One way to the novel treatment of the problems associated with stress and anxiety is the mindfulness-based stress reduction (MBSR), which was first designed by Kabat-Zinn for a wide range of people with stress-related disorders. MBSR decreases the automatic tendency toward emotionally react and ruminates about repeated thoughts and physical sensations; MBSR reduces stress, depression, and stress symptoms, reinforces immune functioning, develops behavioral self-regulation, and improves attention. Since the problems associated with stress are high in spouses and relatively little attention, especially in terms of treatment, is paid to this disorder. In the current study, psychological well-being and emotional regulation of the veterans' spouses with secondary PTSD were noticed, and one of the most modern therapeutic methods was used to improve mental health. The current study aimed at examining the effectiveness of MBSR on emotional regulation and psychological well-being of veterans' homemakers with secondary PTSD. The participants were volunteer PTSD women referred to the counseling centers and had secondary PTSD diagnosis. To determine the sample size for appointment in each of the test and control groups, Cohen's sample size tables were used based on the F ratio., Twenty-five persons were included in each group regarding a confidence level of 90% and the test power of 95%. Participants were selected by the permuted blocked randomization method and divided into two groups of control (n=30) and intervention (n=31). Five participants were dropped out of the control group due to not completing the questionnaire (n = 3) and being sick (n = 2). Six cases were dropped out of the intervention group due to not being present in classes regularly (n = 2), being on a trip (n = 1), not completing the questionnaires (n = 2), and showing no willingness to participate in the study (n = 1). Therefore, 25 participants were left in each group. Participants with at least the elementary education, within the age range of 34â€“40 years, with no psychological disorder were enrolled. After dividing patients into two groups, at first, the demographic questionnaire including age, level of education, and number of children, and then, the questionnaires of emotion regulation and psychological well-being  were distributed among the participants. Afterward, the intervention group was taught according to the MBSR protocol of psychological treatment in eight sessions. The control group did not participate in the sessions and only received treatment as usual. After treatment, the posttest questionnaires were given and again after a month, the same questionnaires were distributed. The data were analyzed using SPSS version 22, and the results of intervention and control groups were compared using the statistical analyses. Demographic questionnaire included age, level of education, and number of children. Emotion regulation questionnaires containing 36 questions were used in which the questions were scored based on a 5-option Likert: 1 never (0 to 10%); 2 sometimes (11% to 35%); 3 often (36% to 65%), 4 usually (66% to 90%), and 5 almost always (91% to 100%). The questionnaire was examined by the researchers and its reliability was confirmed. Internal consistency (0.93) and its subscales' reliability with Cronbach's alpha (0.8) were good for each subscale. The reliability of emotional regulation questionnaire using both Cronbach's alpha and split half were 0.86 and 0.80, respectively (P< 0.01). The Chi-square test was used to evaluate the unique demographic groups. The mean and standard deviation (SD) of emotional adjustment and psychological well-being along with its dimensions between the intervention and control groups were evaluated at 3-time points. The analysis of changes in scores in each of the groups was conducted using analysis of variance with repeated measures. The effect of time represented the change in scores over time and the interactional time-group effect represented a significant difference between the groups. The study was conducted on 50 veteran's homemakers with secondary PTSD, aged 23â€“59 years. Of these, 24 participants had high school diploma and 26 were the university graduates. The mean ± SD of age was 36.36 ± 9.9 years in the intervention and 38.08 ± 71.9 years in the control groups; therefore, no significant relationship was found in age, education level, and the number of children between the groups (P > 0.538). The following results are showing Chi-square and t-test data [Table 1]. In the MBSR group, the mean score of the rejection of emotional response was 16.52 in the pretest and 13.2 in posttest, and 14.32 during the follow-up. In the control group, these values were 15.08, 15.16, and 15, respectively [Table 2]. The effect of time and time-group interaction on the score of emotional response rejection was significant (P< 0.007). 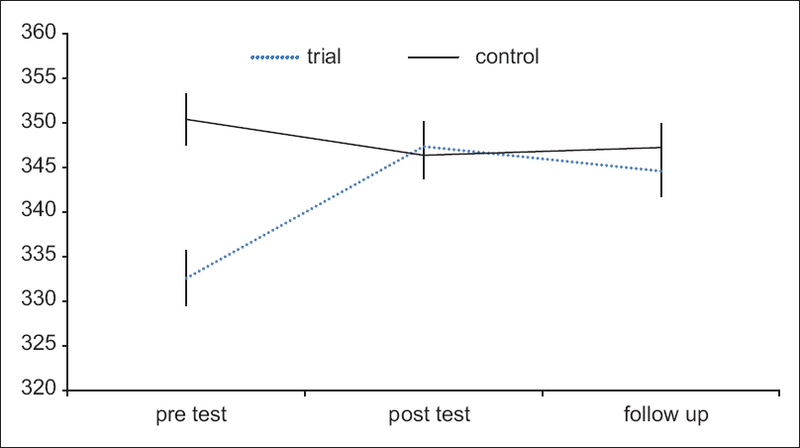 It reflected the influence of the therapy on changes in variables, but the intervention group was not affected by other changes in emotion regulation and the total score (P > 0.147) [Figure 1]. In the MBSR group, the mean score of positive relationship with others in psychological well-being questionnaire was 56.4 in the pretest, 60.08 in posttest, and 58.08 in the follow-up. In the control group, these values were 58.64, 58.36, and 57.96, respectively. Time as well as time-group interaction effect of the changes on the score of positive relationship with others was significant (P< 0.019), indicating the influence of therapy on the change in total [Figure2] and each subscale. Also, the results of the study showed the effect of the intervention-group interaction on the changes in the scores of purpose in life, lack of emotional clarity, and total score (P< 0.046). However, the effect of group on changes of other subscales of psychological well-being was not significant (P< 0.108) [Table 3]. The current study aimed at evaluating the effects of MBSR on emotional regulation and psychological well-being of veterans' homemakers with secondary PTSD. The findings of the study showed the effect of MBSR training on the nonacceptance sub-scale of emotional regulation responses and also it was correlated positively with other subscales including purpose in life, personal growth, and total score in the psychological well-being. 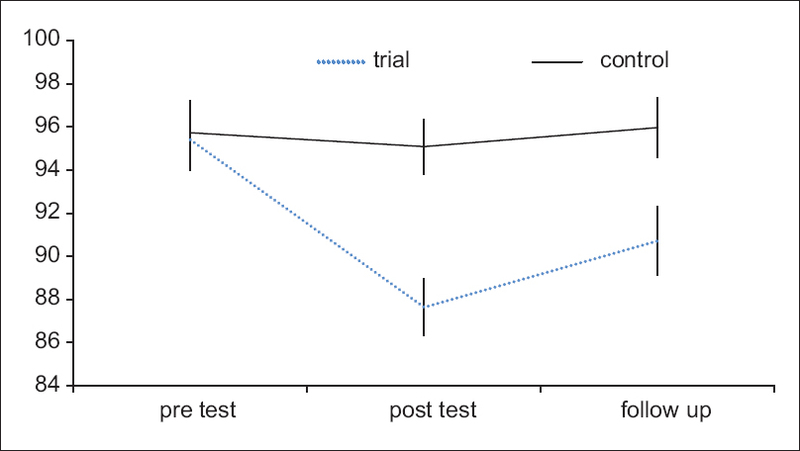 The study findings showed a significant difference in pretest, posttest, and follow-up tests of the above-mentioned scales when comparing trial and control groups. However, in terms of problem in engaging in behaviors leading to difficulty in impulse control, lack of emotional awareness, limitation to achieve emotion regulation strategies, lack of emotional clarity, and total score in regulating emotions as well as subscales of autonomy, self-acceptance, and dominating the environment of psychological well-being, no significant differences were found in the pretest, posttest, and follow-up tests in the intervention group, compared with the controls. The findings of the current study on the components of psychological well-being was consistent with the research findings on the effectiveness of MBSR on psychological well-being in patients with PTSD and their relatives; this showed that MBSR training in pretest, posttest, and follow-up tests had a significant difference both in the intervention and control groups. These findings were also consistent with the findings of another research. In contrast, another study showed no effect of MBSR on psychological well-being that was inconsistent with the findings of the current study. 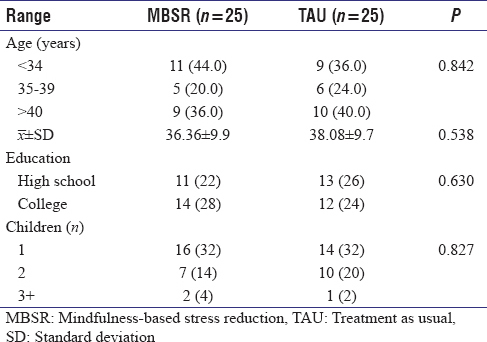 The results of the current study was consistent with other studies in the effectiveness of MBSR on the level of stress and emotion regulation, which showed that the effectiveness of MBSR had no significant effect on mindfulness and the total score of emotional regulation. In contrast to other research findings, they were inconsistent in the sense that MBSR training in the pretest, posttest, and follow-up tests both in the intervention and control groups were significantly different. Based on these results, it can be concluded that the findings in the intervention group were in favor of teaching MBSR. It is noteworthy that sometimes the differences in findings are attributed to the subscales of emotional regulation as well as psychological well-being, which were also noted in the current study. Focus on the present-moment experience gradually changed psychological factors that were easily interrupted with stress. Seeking help from the previous experiences as well as a new view toward MBSR, one can accept trauma along with its resulting problems and enjoy life accompanying pain. Therefore, a purposeful life can be made through adaptation with trauma. Therefore, this training reduces psychological and physical symptoms, provides the ability to cope effectively with stressful situations, and improves the interpersonal relationships in the groups that ultimately lead to the improvement in mental health and psychological well-being. Mental health professionals believe that the practice of mindfulness leads to the growth of different factors such as being nonjudgmental, nonreactive, and action with consciousness. In fact, when mindfulness increases, the ability to stand back and perceive the states such as anxiety increases; therefore, one can free himself from the automatic behavioral status and through understanding as well as second attaining that is not controlled by states such as apprehension and anxiety. To justify the meaninglessness of some subscales considering the issue that similar to other therapies, the overall efficacy of this technique cannot be expected on people with diseases and different characteristics. It can be said that other uncontrolled factors can affect the inefficacy of MBSR on the above-mentioned subscales such as mental ruminations and experimental avoidance from trauma, inflexible coping style different personality traits, not enough time to do the exercises at home and lack of motivation, especially in the particular group whose husbands had PTSD and may need a long-term individual psychotherapy. The current study along with other findings showed the positive impact of MBSR on different components of psychological well-being and emotional regulation. Thus, considering such matters is important in the treatment of veterans with PTSD (early PTSD) and their spouses showing secondary PTSD symptoms. Based on the small sample size, the findings should be interpreted and generalized cautiously. However, the current study looks promising for further studies in accordance with positive impact of MBSR on the components and subsequently improvement of the quality of life as well as mental health. Authors are grateful to Foundation of Martyrs and Veterans Affairs and also the veterans for their participation in the MBSR interventions. The study was funded and supported by the Deputy of Research in Kashan University of Medical Sciences; Grant No: 9076. Omidi A, Mohammadi A, Zargar F, Akbari H. Efficacy of mindfulness-based stress reduction on mood states of veterans with post-traumatic stress disorder. Arch Trauma Res 2013;1:151-4. Anne Ranee F. Secondary Traumatization of the Mental Health Professional. UK: Newsletter; 2002. Koenen KC, Stellman SD, Sommer JF Jr., Stellman JM. Persisting posttraumatic stress disorder symptoms and their relationship to functioning in Vietnam veterans: A 14-year follow-up. J Trauma Stress 2008;21:49-57. Renshaw KD, Rodrigues CS, Jones DH. Psychological symptoms and marital satisfaction in spouses of operation Iraqi freedom veterans: Relationships with spouses' perceptions of veterans' experiences and symptoms. J Fam Psychol 2008;22:586-94. Klarić M, Frančišković T, Obrdalj EC, Petrić D, Britvić D, Zovko N, et al. Psychiatric and health impact of primary and secondary traumatization in wives of veterans with posttraumatic stress disorder. Psychiatr Danub 2012;24:280-6. Solomon Z, Levi G, Waysman M, Fried B, Mikulincer M, Florian V, et al. Secondary traumatization among wives of soldiers with combat stress reaction. Harefuah 1993;124:750-6, 796. Crumpton NM. Secondary traumatic stress and mindfulness training. J Emerg Nurs 2010;36:3-4. Kabat-Zinn J, Santorelli S. Mindfulness-based Stress Reduction Professional Training Resource Manual. Worcester (Mass): Center for Mindfulness in Medicine, Health Care and Society; 1999. Manguno-Mire G, Sautter F, Lyons J, Myers L, Perry D, Sherman M, et al. Psychological distress and burden among female partners of combat veterans with PTSD. J Nerv Ment Dis 2007;195:144-51. Momeni J, Omidi A, Raygan F, Akbari H. The effects of mindfulness-based stress reduction on cardiac patients' blood pressure, perceived stress, and anger: A single-blind randomized controlled trial. J Am Soc Hypertens 2016;10:763-71. Cohen J. Statistical Power Analysis for the Behavioral Sciences. Hillsdale, NJ: Lawrence Earlbaum Associates; 1988. p. 55. Bayani AA, Koocheky AM. Reliability and validity of Ryff's psychological well-being scales. Iran J Psychiatry Clin Psychol 2008;14:146-51. Gratz KL, Roemer L. Multidimensional assessment of emotion regulation and dysregulation: Development, factor structure, and initial validation of the difficulties in emotion regulation scale. J Psychopathol Behav Assess 2004;26:41-54. Narimani M, Ariapooran S, Abolghasemi A, Ahadi B. Effectiveness of mindfulness-based stress reduction and emotion regulation training in the affect and mood of chemical weapons victims. 2012. Arak Med Univ J 2012;15:107-18. Nyklícek I, Kuijpers KF. Effects of mindfulness-based stress reduction intervention on psychological well-being and quality of life: Is increased mindfulness indeed the mechanism? Ann Behav Med 2008;35:331-40. Davidson RJ, Kabat-Zinn J, Schumacher J, Rosenkranz M, Muller D, Santorelli SF, et al. Alterations in brain and immune function produced by mindfulness meditation. Psychosom Med 2003;65:564-70. Polusny MA, Erbes CR, Thuras P, Moran A, Lamberty GJ, Collins RC, et al. Mindfulness-based stress reduction for posttraumatic stress disorder among veterans: A Randomized clinical trial. JAMA 2015;314:456-65. Serpa JG, Taylor SL, Tillisch K. Mindfulness-based stress reduction (MBSR) reduces anxiety, depression, and suicidal ideation in veterans. Med Care 2014;52:S19-24. Carmody J, Baer RA. Relationships between mindfulness practice and levels of mindfulness, medical and psychological symptoms and well-being in a mindfulness-based stress reduction program. J Behav Med 2008;31:23-33. Kearney DJ, Simpson TL, Malte CA, Felleman B, Martinez ME, Hunt SC, et al. Mindfulness-based stress reduction in addition to usual care is associated with improvements in pain, fatigue, and cognitive failures among veterans with gulf war illness. Am J Med 2016;129:204-14.